Written by Margaret Weis, your Crew is hired by a wealthy cattle baron to get his daughter to her wedding... whether she likes it or not. Andrew Peregrine writes an Episode about saving a Shepherd's orphanage in a no-holds-barred boat race that'll tug at the Crewe's heartstrings. Monica Valentinelli hints about a secret buried under Serenity Valley. This puts your Crew between a nasty Guild Trader and a determined Alliance colonel. Nicole Wakelin writes about how the Crew needs to help an old friend get her cash, her ship, and her ma to a new life - before her old one catches up with her. Play as one of nine Serenity crewmembers or choose from one of twelve archetypes. 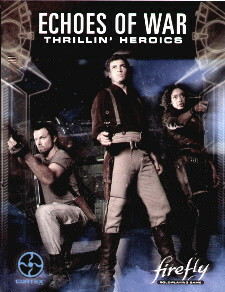 Echoes of War is compatible with the Firefly Role-Playing Game corebook, and includes quickstart rules and characters. Be sure to grab a GM and three-to-five of your fellow Firefly fans before you sit down for several evenings' worth of fun.